Watching the ABA Rare Bird Alert is sometimes exciting, boring or frustrating. Exciting when a rare bird is reported close to home and "chaseable". Boring when the list contains birds that you've already seen. Frustrating when a mega rare bird shows up in a place that you cannot get to or at a time when you are not able to go see the bird. Such was the case of the Great Black Hawk this year. The Great Black Hawk is a hawk of Central America that has never been recorded north of the Rio Grand river. In April, one showed up in Corpus Christi TX which is as close to Mexico as you can get without climbing over that stupid wall. It was a one-day-wonder. Seen, then gone assumingly back over the border. 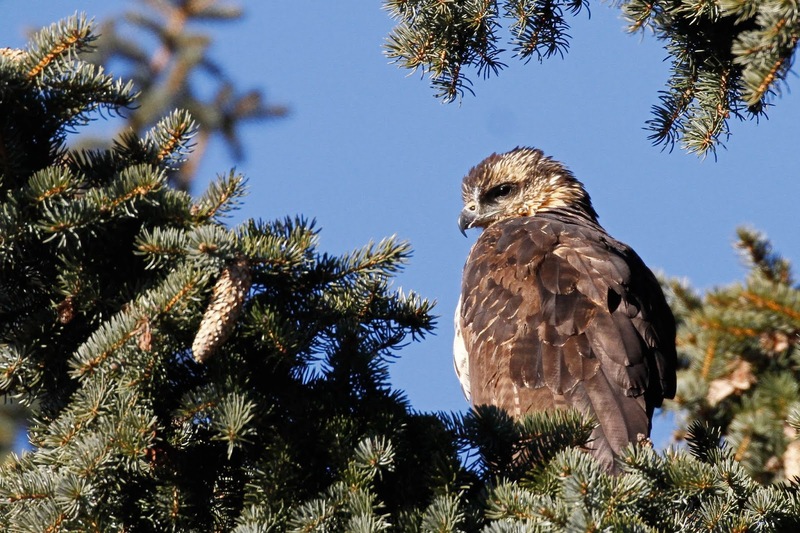 But then in August, the same hawk was reported in Maine of all places. But again, it disappeared after just 2 days. 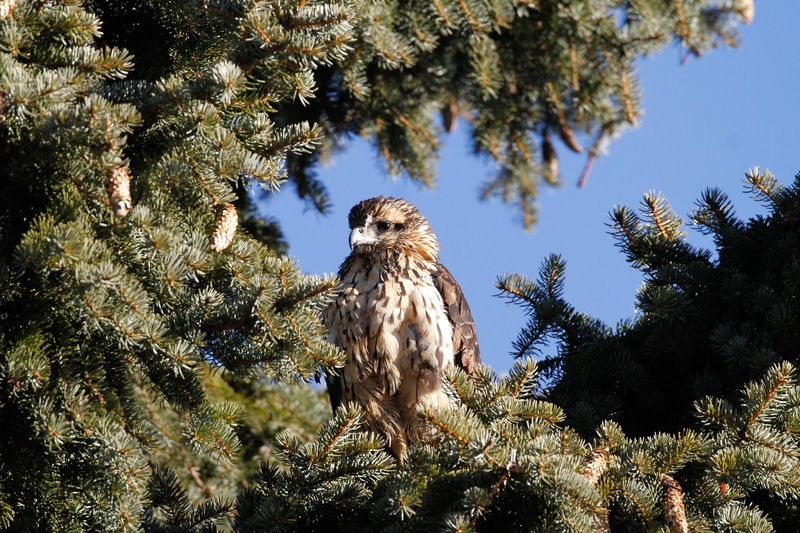 In November, the bird was re-found in a city park in Portland Maine. This time, the bird found a suitable habitat and has been in or around the park for 2 months. I had to go see the bird but didn't have time with work and holiday travel obligations. I hoped that the bird would be around after New Year. It did. I drove up to Maine with a birder that I haven't traveled with before. We had a great time. We left at 1:00 AM, arrived in Portland at 7:15 AM and had the bird by 7:30. Easy-peasy-lemon-squeezy. Sara did the research that said the bird was hanging out in trees across the street from the "Holy Donut" shop. Ta-da. This bird is a juvenile hawk otherwise it would in fact be black. Honestly, I probably wouldn't have given this bird another look if I didn't know it was super rare. It looks like a lot of other common hawks. The bird is molting out his/her kid feathers and starting to grow the black ones. You can see a few popping in on the bird's back in this photo. The bird is definitely a celebrity in Portland. We had a few people stop to see the bird and talk to us about it including school children and teachers from the school on the corner, a guy that stops everyday, a woman whose blind boyfriend lives in the apartment where the hawk is hanging out, and even a panhandler wanted to know what we were looking at (and didn't ask us for money either). 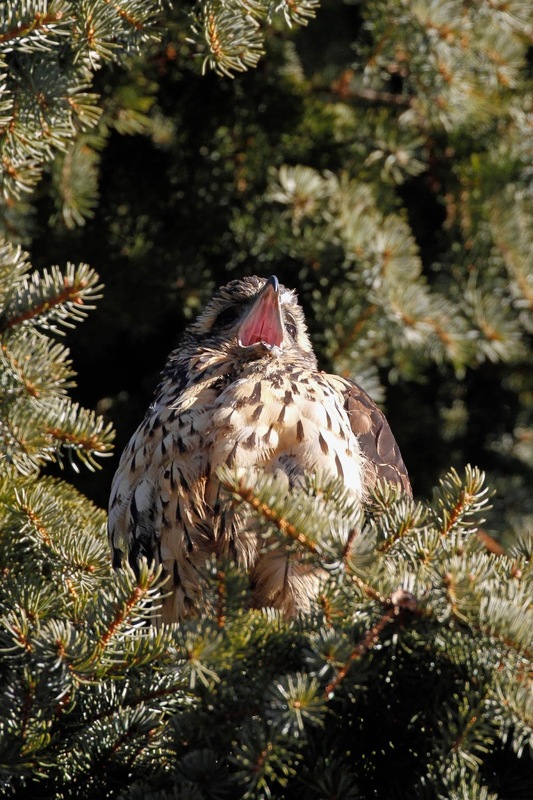 Other birders have watched the hawk catch squirrels and rats (reason that we didn't get a donut . . . ) but all the bird did when we were there is sit in the trees. He/she was even boring herself. We were home by 3:30 PM with another mega rare bird on our list and a few fun stories. UPDATE: Sadly, the Great Black Hawk succumbed to frost bite and was euthanized in February.